I suspect having polytablet relationships is our future. This will become the norm. What's interesting to me is how we got here, which, if you think about it, is a situation unique to tablets. Most people don't own more than one music player, as they probably have a primary iPod, Zune (RIP), or, more than likely, a smartphone. It's doubtful that you have multiple PCs — well, more than one that you use regularly. Granted, I have a friend who has four fully-functional computers in his office, but he runs a tech startup, which is kind of like someone being surprised that I own more than one dictionary. But aren't tablets just portable PCs or, more crudely, giant smartphones? Remember last year, when people accused the iPad of just being a giant iPod? Somewhere along the lines our paradigm shifted. Tablets became this "other" category where it was OK to have separate, but equal devices. I think we'll start to own multiple tablets because they are cheap enough to purchase (thanks, Amazon!) and yet diverse enough to justify the purchase itself. For instance, the cult-favorite Microsoft Zune got a following because it allowed you to share music, albeit in a limited way. I argue that the Zune got its popularity because it actually did something different – anything different – than the average music player. Music players play music. Why do you need multiple ones? 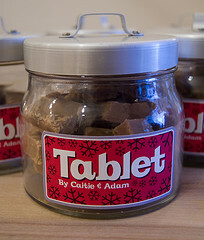 Tablets, on the other hand, could become as diverse as smartphones. You have your Wi-Fi only low-end viewer (Kindle Fire), your app-fueled popular device (iPad 2), your super-cheap experiment (HP TouchPad), and so on. The iPad might have started the market, but I have no doubt that it will lose the reigning champ status. There are just too many other things we want to do with a tablet that the iPad isn't letting us do. Heck, there are things we don't even know we want to do until a device allows us, too. It seemed totally logical for me to plunk $199 on a Kindle Fire moments after it was available. I was traveling when it was announced, so I bought it using Safari on my iPad 2. I'm sure I created some type of space-time loophole. But that doesn't make me an addict, right? Right?